Oil fell to a three-month low in New York as supplies were considered to be plentiful even as stockpiles were seen deepening a record pullback in the U.S., the biggest fuel consumer. 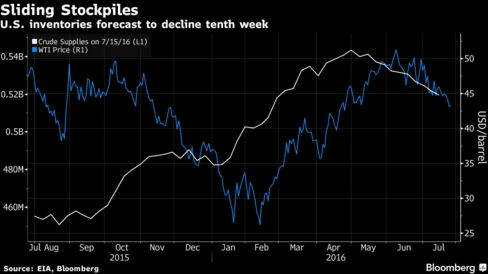 West Texas Intermediate futures declined 1 percent after falling 2.4 percent Monday. While U.S. crude inventories probably slid by 2.25 million barrels last week, gasoline supplies are seen increasing by 600,000 barrels, swelling stockpiles that are also at the highest in decades, according to a Bloomberg survey before an Energy Information Administration report Wednesday. Crude has slipped more than 15 percent since early June after almost doubling from a 12-year low in February as supply disruptions from Nigeria to Canada trimmed a worldwide surplus. BP Plc, the first oil major to report second-quarter results, missed analysts’ estimates as lower prices continued to erode income and refining margins shrank. West Texas Intermediate for September delivery dropped as much as 54 cents to $42.59 a barrel on the New York Mercantile Exchange, the lowest since April 26, and traded for $42.70 at 11:21 a.m. London time. The contract lost $1.06 to $43.13 on Monday. Total volume traded was about 1.4 percent above the 100-day average. Brent for September settlement slipped 31 cents, or 0.7 percent, to $44.41 a barrel on the London-based ICE Futures Europe exchange. Prices dropped 2.1 percent to $44.72 on Monday. The global benchmark crude traded at a premium of $1.71 to WTI. U.S. stockpiles were at 519.5 million barrels in the week ended July 15, more than 100 million barrels above the five-year average, according to data from the EIA. Crude production increased for a second week to 8.5 million barrels a day as the nation’s drillers put rigs back to work. China National Petroleum Corp. said its Changqing field, the country’s biggest oil and gas producer, rebounded from losses earlier this year to post a first-half profit amid reduced spending. The re-opening of two of Libya’s biggest oil ports may be delayed as the hardening positions of rival factions pose a fresh challenge to international efforts to reunite the country and restore its exports. Structural changes are required to keep the North Sea competitive amid low oil prices, Royal Dutch Shell Plc said before workers went on strike.